, but actual improvements are being made in the visual abilities of recipients. There are however, as with most groundbreaking medical prospects, some pros and cons to this new treatment option. 1. Cost: The current formulation of this injectable type of macular degeneration treatment, known as Lucentis – the only one that has been thoroughly studied and tested, costs $1950 per treatment. That may sound like a great bargain for regained visual ability, but with the macular degeneration injections being done monthly, that cost can be staggering in the long term, although many insurance plans make this cost more affordable to plan participants. 2. Complications: Although most are infrequent and even rare, there are complications associated with macular degeneration injections. One unusual specific is retina detachment, although this occurs in less than .01% of people receiving the treatments. 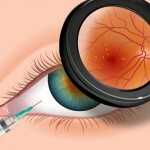 Another concern is infection, which is a common risk factor in many types of medical procedures and is not unique to macular degeneration injections. 1. Sight Improvement: Most forms of treatment for this age related condition improve merely preventing the worsening symptoms of macular degeneration. However, the use of this type of treatment has been shown in studies to actually improve the sight of recipients, a claim that cannot be made with macular degeneration vitamins, a method used to stave off the effects of worsening vision, or glasses for macular degeneration which are merely used to help with magnification and assist with blurriness. 2. Minor Procedure: Unlike surgical applications, most of the time macular degeneration injections can be performed in examination rooms and doctor’s offices and don’t require trips to the hospital or operating room. Additionally, anesthetic involves only a topical application and there is usually no need to be put to sleep. Not only does this simpler solution mean less discomfort and recovery for the afflicted, but also less risk of typical surgical complications. Your doctor will decide if macular degeneration injections are ideal for you. This analysis will be based on your current condition, but also some other important factors such as you general overall health and and underlying medical conditions that you have or medications that you are taking. In some cases, you may have to refrain from use of medications prior to having an injection and your health care provider will alert you to these types of contradictions and talk to you about what they mean and how they will affect your care. Macular degeneration is the most common cause of vision loss in the elderly; however this new and exciting form of therapy may help sufferers regain part of their lost visual sense. It’s wise to discuss this form of treatment with your doctor to help determine if this is the right form of therapy for you and your important eyes.